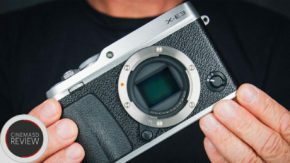 FUJIFILM has just announced its new flagship APS-C sensor size, X mount video-oriented mirrorless photo camera, the X-H1. It’s safe to say that while developing this camera, FUJIFILM had us – the filmmaking community – in mind. 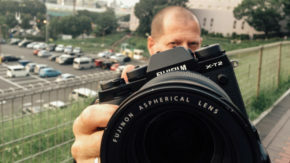 The race to capturing the hearts of filmmakers has just become tougher with the introduction of the new FUJIFILM X-H1. 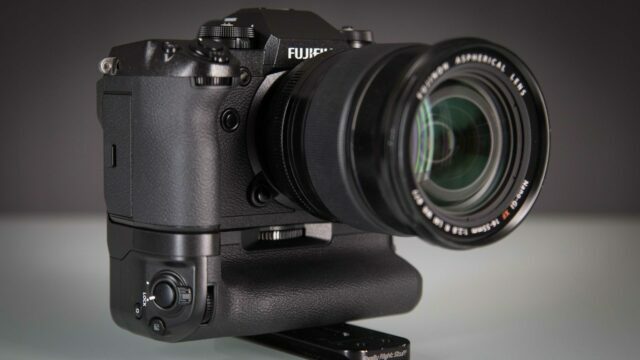 Built on the heritage of the successful FUJIFILM X-T2, this new top-tier camera is rolling out with included additional features that are likely to appeal to many: the 5-axis in-body stabilization system, included F-log and the newly-developed ETERNA film simulation picture profile, just to name a few. The new camera felt very robust in my hands and operating it was very similar to using the older X-T2, except for the new AF-ON button – very useful when shooting in manual focus mode and using the EVF: just press this button and get your desired point instantly in focus. The new X-H1 uses a new vertical power booster grip, which I personally like to work with as it adds more stability when holding the camera. Speaking of which: the booster grip also adds additional benefits, like being able to monitor sound via the included headphone socket, support for 3 batteries for longer shooting periods and, last but not least, doubling the total length of the recording time when shooting in 4K, for a total of 30 minutes instead of 15. Photo menu is totally greyed out. Perfect! 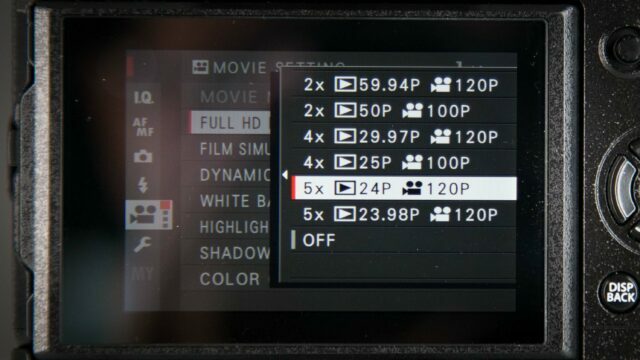 When wanting to re-adjust a parameter after fiddling with whatever function in the “SET UP” menu, the camera will take you back to the general video menu. This is a bit of an uncomfortable and time-consuming procedure as, at times, one will want to adjust that exact parameter again without starting all over from the main menu. 5-axis in-body stabilization system, which worked wonderfully with the tested FUJIFILM XF 16-55mm f2.8 R LM WR lens. The inclusion of a built-in F-Log gamma option. This much-anticipated feature will help many with their creative filming and post production work. 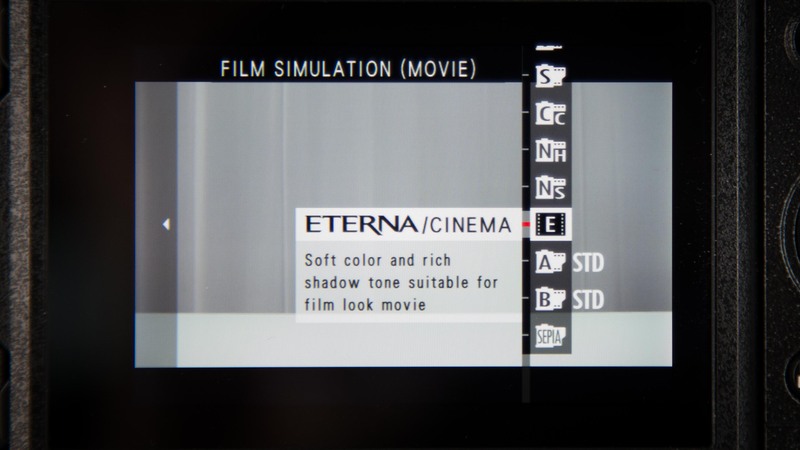 For those who would like to have instant “cinematic” colorful results, FUJIFILM is introducing its newly-developed ETERNA film simulation picture profile. I’ve tried it, I like it, and I’ll be using it whenever there is no time to experiment or go through the process of a color correction session. 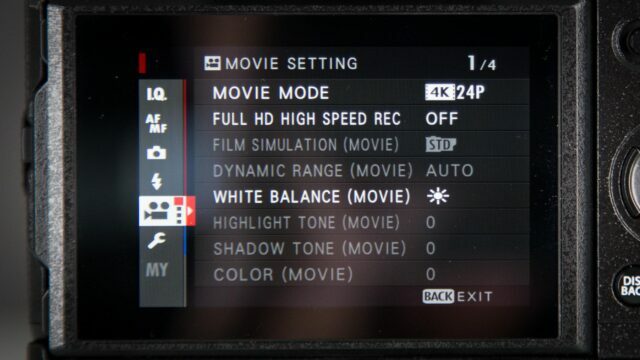 On top of the above, it is worth mentioning the Dual SD slots with relay recording functionality, front and rear tally option, the ability to record 120fps in full HD mode, DCI 4K setting (24p only), silent video operation mode (see detailed explanation below in the “Pros” section), good low-light performance and a high data rate recording of up to 200Mbps. This is also the place to mention a video feature that is not yet functional, but will be next month. 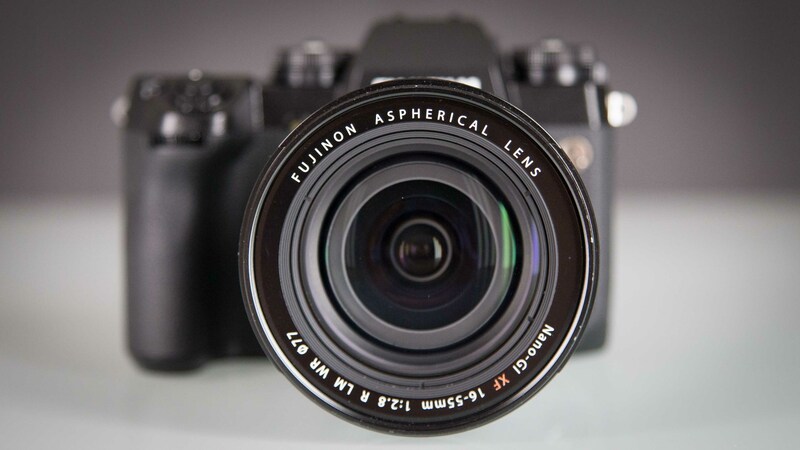 I’m talking about the launch of the FUJINON X mount MK lenses. These high-quality, lightweight and compact lenses will be a perfect match for the new camera and besides of benefiting from the 5-axis in-body stabilization system, I’m eagerly waiting to see what else this combo will bring. 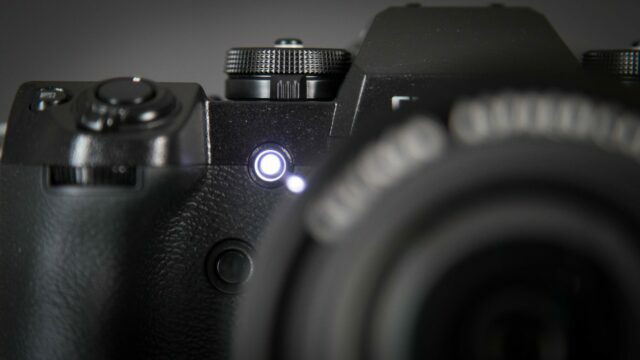 This is where this new camera shines. There is something very cinematic in the look and feel of the picture, and even the noise in high ISO settings (like 5000) is not really disturbing, looking at times like film grain. On the downside, it is truly a pity that FUJIFILM did not implement 4K 50/60p recording and, when it comes to the recorded bit depth and color sampling, apparently the current sensor/processor combination is not able to record in the much-desired 4:2:2, 10-bit specification environment. When it comes to audio, the built-in microphones will capture sound in 24bit / 48KHz quality but, most importantly, the external audio sound recording quality is very impressive. One reason for this might be due to FUJIFILM adding the possibility to disable the low cut filter in camera. This can obviously give a richer sound to any interview, for example. 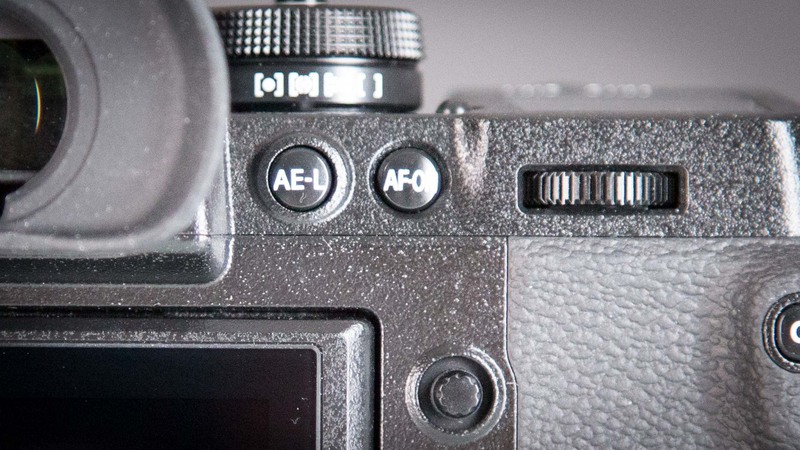 I haven’t seen this feature being implemented internally in other mirrorless cameras. 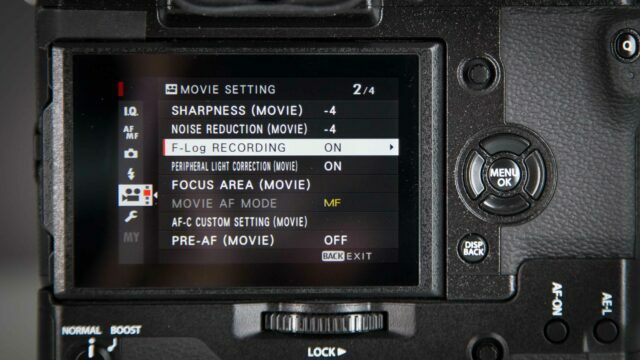 Its current firmware is where the camera scores the lowest for me. 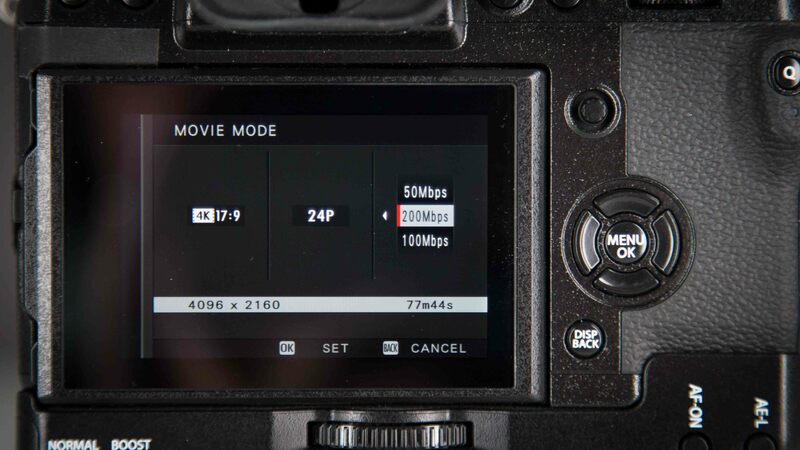 The three main obstacles are a somewhat inconsistent continuous autofocus performance in video mode, an issue with manual focus and inconsistent sound performance. Continuous autofocus performance: I’m yet to solve this mystery… At times, this camera’s autofocus works like a treat, and no matter what I’m pointing it at, it will achieve perfect focus. 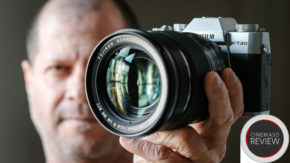 In other filming situations, the autofocus will hesitate or simply not work well. Bottom line: either I’m doing something completely wrong with my settings or the autofocus performance needs to be improved. I’ll keep exploring this and update my article if needed. Manual focus performance: it is great to have the ability to zoom-in while checking focus manually (the camera will automatically enlarge a part of the picture when in standby or recording mode). 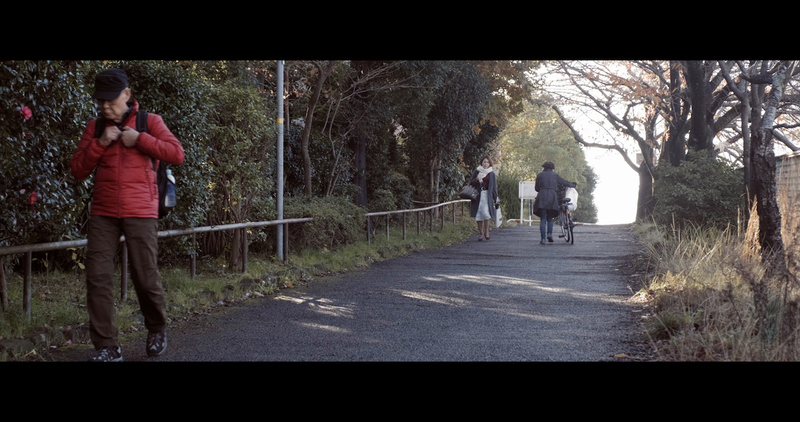 BUT, after being done with adjusting focus, the picture will not resize back to the original framing perspective. Try to imagine working handheld during a documentary situation, focusing on a subject and then trying to blindly find the Disp/Back button at the back of the camera in order to go back to your original framing. It’s almost impossible to do so without adding shaky camera movements. Inconsistent sound performance: while the recorded sound quality is truly exceptional for this type of camera, there are three issues with sound. Truly nice 4K (DCI 4K) video quality! Good battery life. Having three batteries (one in camera and 2 in the handgrip) helped me to shoot throughout the whole working day without a problem. Dynamic range is stated in percentages (400%, 200%). 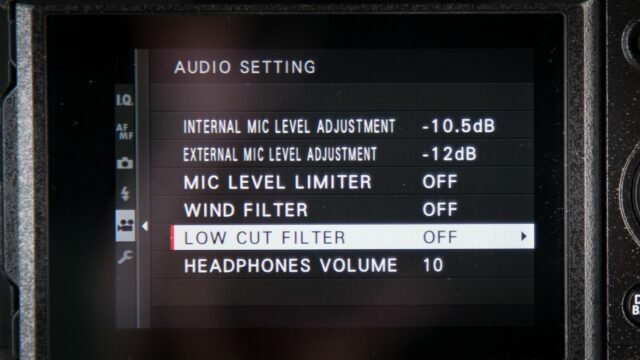 For us filmmakers who talk in “stops”, this piece of information is a bit useless. 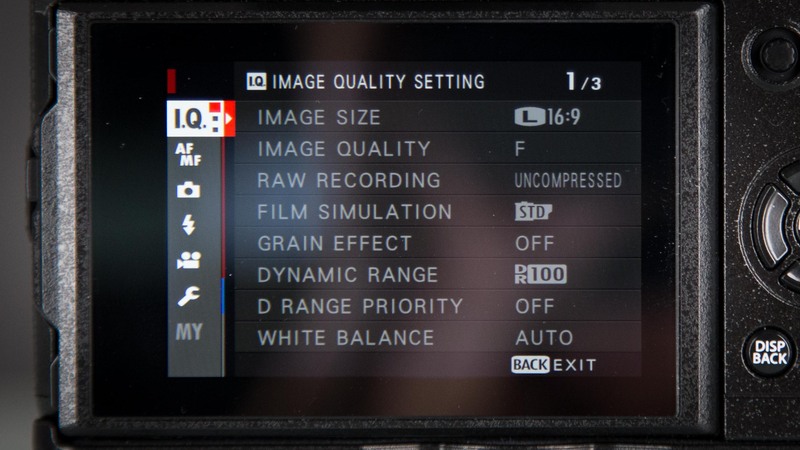 I understood from FUJIFILM that different shooting modes result in different dynamic range values, so how about pre-setting the camera to give the best possible dynamic range at any setting without the possibility to choose to lower it in the menu? 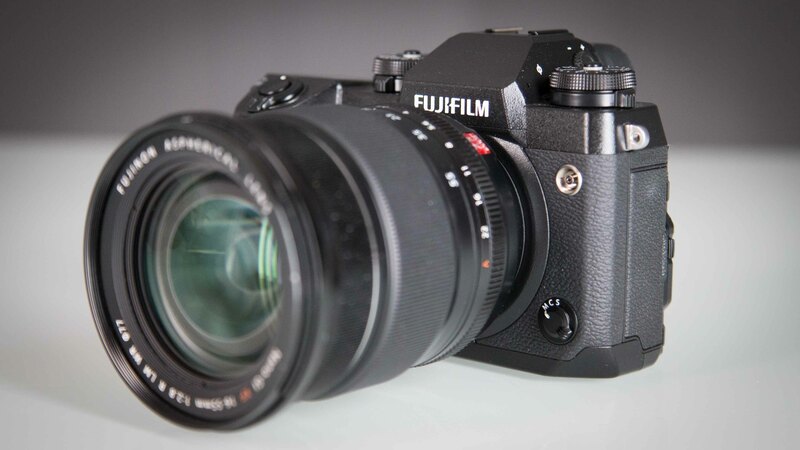 With the introduction of the new X-H1 camera, FUJIFILM is slowly but surely closing the gap between its video-oriented mirrorless photo cameras and its rivals. It is also very clear that FUJIFILM is very determined to listen and cater to the needs of the filmmaking community. The thing is, my above statement is relevant for the present time and, while this camera is nice to work with, it will have to go through one or two firmware update cycles in order to fix some of the glitches mentioned in my review and fulfil its true potential. Additionally, current models from other respected manufacturers with enhanced functionality – be it 4K50/60p frame rate, 10-bit recording, better color sampling or higher low-light sensitivity – are aiming to capture that exact same crowd. So, in short, does this camera offer enough to make one jump on the FUJIFILM bandwagon? Time will tell, but the direction is extremely positive. Camera settings used for most of the inserts in my review: When on F-Log: Sharpness -4, NR -4. When on ETERNA film Simulation: Sharpness -4, NR -4, Shadow Tone 0, Highlight Tone 0. All was shot on DCI 4K 24p, 200Mbps. Edited on Adobe Premiere Pro latest edition. Color corrected with FilmConvert X-T2 preset. No sharpening added to the final video. Many thanks to Sakiko Takahashi and Natalie Behiri. What is your take on the FUJIFILM X-H1. 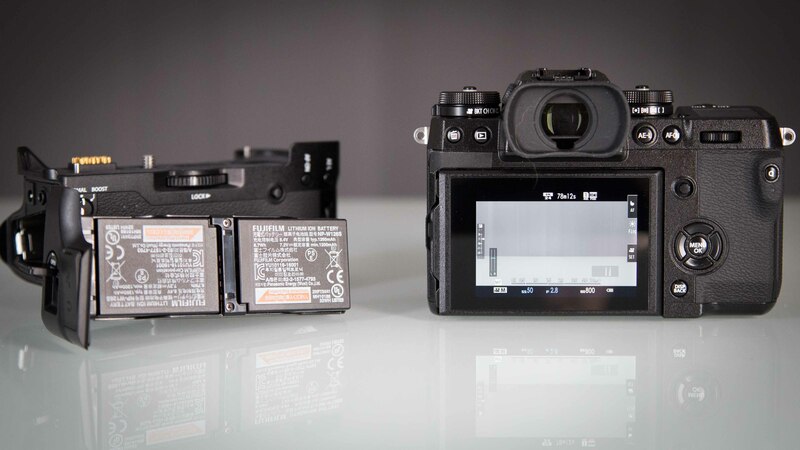 Are you impressed with what this camera has to offer and can you see yourself updating your current gear with it? Share your opinion with us in the comment section below. Thank you – looks like Fuji is where Sony was 2 years ago. I was waiting for this cam but at this price point the GH5 is way ahead in all aspects. 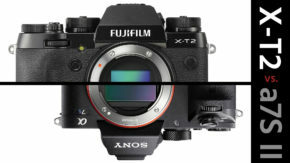 Yeah, and I think the problem is the X-H1 is actually more heavy and bigger than the A7riii, so it’s really competing with full frame cameras. Tough competition. Thank you Tim. Truly appreciated!